What happens within my courses? How successful are participants? Are there stumbling blocks? With Coursepath’s advanced reporting, managers and trainers discover great opportunities to monitor learning progress and compare results. A range of filtering options enables precise comparison per target group, e.g. of users subscribed to a special program. Other than course performance as a whole, individual participant’s or single step’s performances can be reviewed. 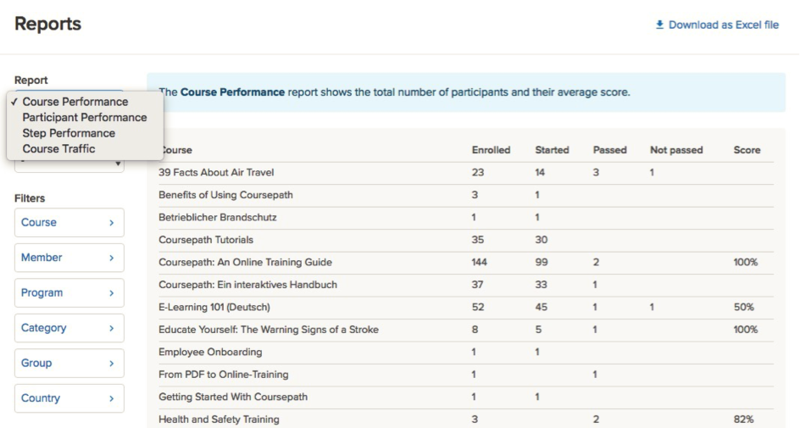 The Coursepath reporting displays relevant information on course performance in differently filtered tables. 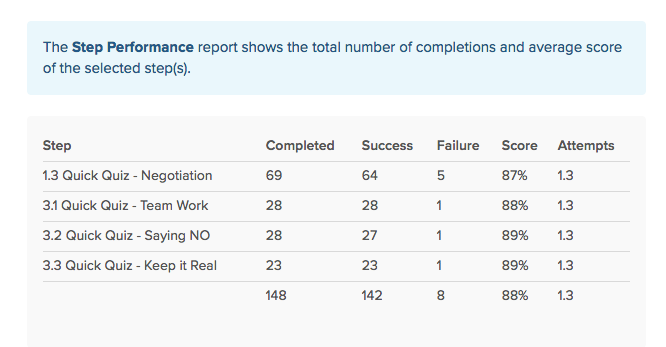 Shown here: completed steps (successfully finished or failed), average scores and attempts for separate steps. The reporting option first lets you choose the kind of report you want to display: performance in each course, for each participant, for each step or the general course traffic. The Course Performance report shows per course the total number of participants and their average score. The Course performance shows accumulated results for the entire course, resp. all courses. There is not made a distinction between individual members in this option. The Participant Performance report shows the individual status, progress and score of one or several participant(s). It can be narrowed down by member(s), groups and country. You then receive a report on Status, Progress, Score, Enrolled, Started, Passed and Not passed. The Step Performance report shows the total number of completions and average score of the selected step(s).See how many steps have been completed and how many participants were successful or failed. You can also see the attempts needed to complete all learning steps. The Course Traffic report shows the total number of course page visits spread over the month. Filter options: Reports per course, member names, program, category, group or country. Shown here: report on Course Performance. Secondly, filtering options can be enabled. Filters can be applied for courses, members, programs, categories, groups and countries. By ticking separate courses or members etc. you create a list of relevant data to be displayed and can easily compare status or progress for individual target groups. Example of a filter. Shown here: Filter by country. On a course level, you basically find the same reporting and filtering options as described above. The difference between reporting on academy levels and course levels is mainly based on data separation: managers of the academy find a quick overview of the entire academy, including all members and courses, while trainers are limited to results and participants of their own courses. This careful separation is one of the unique features in Coursepath. On a course level, trainers and managers have access to participant performance, step performance and course traffic. These reports can be filtered by member, group and country. Similar to reporting of training progress on academy level but slightly reduced: filter options on course level.